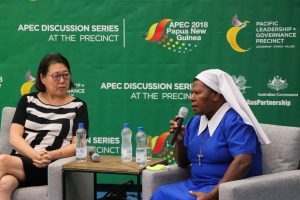 Technology has potential to transform primary health care in Papua New Guinea according to local and international experts at a public discussion held during APEC Health Security Week. 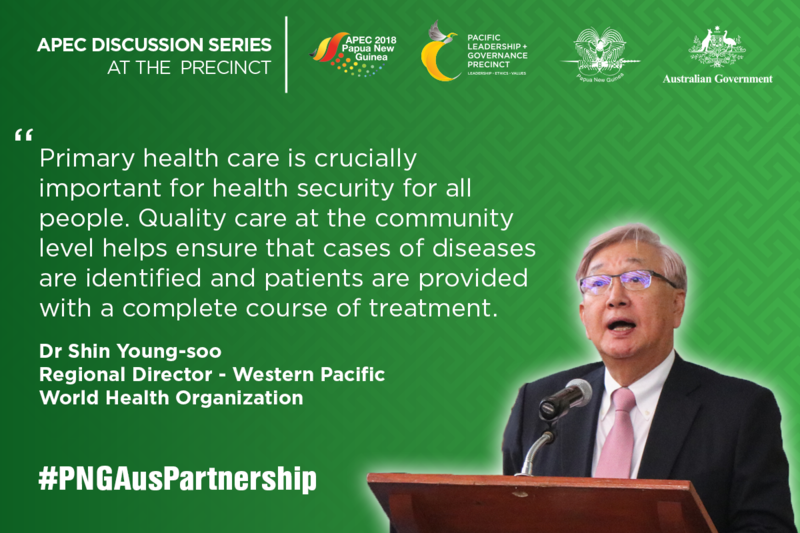 The fourth event in the APEC Discussion Series at the Precinct included a keynote speech by Dr Shin Young-soo, World Health Organization (WHO) Regional Director, and a panel discussion that featured Hon. Sir Puka Temu CMG KBE MP, Minister for Health and HIV/AIDS, and Dr Vivian Lin, former World Health Organization (WHO) Director for Health Sector Development. Sir Puka on the panel at the APEC Discussion Series. The event coincided with APEC Health Security Week and was the fourth iteration in the series, which has offered unprecedented public access to local and visiting experts on APEC topics – including economic integration agriculture and health. The conversation was centred on primary health care and the panellists were quick to highlight the relevance of the 2018 APEC theme – ‘Harnessing Inclusive Opportunities, Embracing the Digital Future’ – to health in Papua New Guinea. 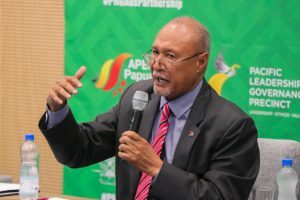 Sir Puka said Papua New Guinea has the potential to make a technological leapfrog and cover the country with health care services. Sir Puka Temu also said the health of people across the country depends on both investment in health services and supporting infrastructure. “mHeath is not an expenditure item – it is an investment item. We invest in the health of the nation,” he said. “The bulk of positive health outcomes don’t come from direct health interventions – they come from non-health interventions,” he continued. In his keynote address, Dr Shin said primary health care is crucially important for health security for all people, but that building these health services is neither easy nor quick. “It takes time to build and maintain the right physical infrastructure, to train the workforces, and ensure good planning and links to other parts of the health system,” he said. “Right now there is an outbreak of polio in PNG and this is a perfect example of the need to keep investing in primary health care to ensure that every man, woman and child gets essential services – such as immunisations. Dr Vivian Lin and Sr Celine Yakasere provide perspectives on the importance of primary health care. According to the WHO, the rise of mobile of technologies, applications and cellular networks has the potential to improve and permanently alter the way health services are delivered, and Dr Vivian Lin believes innovation can support health workers to communicate successfully with communities. “Health – apps on the phone – can, in real-time, let you know how many people are waiting at all the emergency departments and what the waiting time is. That helps people actually make choices about where they may go,” Dr Lin said. Dr Lin also said that community partnerships are vital for formal health care systems to function well. “One of the really important things about primary health care is that it’s not just about individuals seeking care – it’s about engaging with communities,” she said.